Independent Residence sea view, private pool in Polignano a mare. Italy - Surrounded by greenery of Puglia, in the hills and a few steps from the beach, HOME VILLA DEL MONTE has an amazing panoramic view of the sea and a beautiful stone pool; It offers various independent suites scattered along the slopes of the hill and surrounded by ancient olive trees. The Villa is great about 300 square meters and is beautifully furnished. The suites also feature full kitchen and bathroom and are equipped with air conditioning and LCD TV. Furnished according to the dictates of a sophisticated design, they are different from each 'other. Depending on the size, location, internal characteristics, have been ascribed to them the names of the winds, Maestrale and Scirocco and Tramontana. 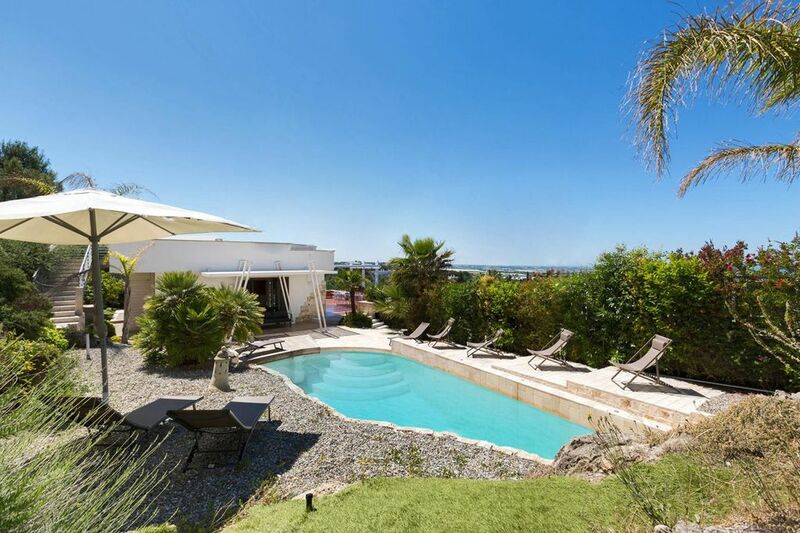 For those who love the sea, the possibility of staying in a house facing the sea in a panoramic position. We are just from Polignano a Mare with its caves, about 5 km from the trulli of Alberobello about 18 km. Renovated for about a year and equipped with all amenities. Possibility to have lunch or dinner with sea views. Sandy coves nearby and the stone swimming pool at home allow you to live your day at sea and at the same time experience the privacy and romance of the house. A unique holiday to remember forever in the heart of Puglia. The last executions bathrooms all complete and finely furnished apartments are throughout the villa to room service. Each bedroom has a private bathroom. Kitchen with panoramic sea view. Dining area with sea view. At about 2 km you can enjoy bathing beach in full payment of all services. In addition, a few hundred meters from the villa you can dine at the rooftop restaurant La Vedetta, where you can enjoy typical Apulian dishes based on land and sea, while you can enjoy the wonderful view of Mount San Michele overlooking the sea. Stayed here with seven people for a six day trip in Puglia. The house was amazing! Lots of space with a beautiful setting a bit away from the town. We had an exceptional stay and the owner was really responsive. They also worked with us when we had a late arrival and left us some really nice food and drinks to welcome us. Everything was clean and well managed, and a beautiful pool area as well. Beautiful, beautiful! Loved Puglia, loved this villa. We travel a lot and this was one of the most beautiful villas we have rented. The setting was gorgeous. Location was very good- 20-30 minutes to Bari, 20 mins to Polignaro a Mare, 10 minutes from small but lovely town of Conversano, but out of the traffic and commotion. From pictures and reviews, hard to know a place till you get there, but this was as lovely as it looks. Rooms looked like out of a beautiful home digest. We had two couples and each basically had their own level of the house with large bedrooms and large sitting areas and 2 kitchens. Beautifully appointed and furnished. Leo and Vittorio left us with bread, wine, cheese, fruit baskets, etc. All very nice. A couple of minor technical glitches were not a big deal and they were helpful in resolving. Beds were a bit firmer than we preferred but we all ended up sleeping well. All in all, a very lovely stay. For experienced travelers, we all felt like this was one of the most beautiful places we had stayed. As my friend said the first night, as two hours after arrival, we sat at outdoor table, drinking wine, watching sun setting over the sea, "It doesn't get much better than this." The other thing that was great was Puglia itself. sixth time in Italy but we didn't know that much about it. Beautiful. While we knew it was a poorer area, didn't feel that way. In the towns, people are out and enjoying and very friendly and in a very casual way. Eine wunderschöne Villa, in der es an nichts fehlt und in der man einfach den Urlaub genießen kann. Wir haben mit zwei weiteren Familien dort unseren Urlaub verbracht und überlegt, ob es überhaupt nur einen Kritikpunkt gibt, aber es war einfach perfekt und wir können nichts negatives nennen! Neben der traumhaften und sehr gepflegten Villa wurden wir mit einem sehr liebevollen und großzügigen Willkommens- Korb voller Leckereien begrüßt. Während unseres Urlaubs wurden kleinere Defekte sofort behoben und der Besitzer der Villa war zu jeder Zeit sehr freundlich, hilfsbereit und nett! Selbst die Reinigung der Villa ist hervorzuheben, da diese mit viel Liebe zum Detail umgesetzt wurde. Umliegend sind einige schöne Städte und Strände mit dem Auto schnell erreichbar und wirklich sehenswert. Supermärkte sind ebenfalls im Umkreis. Inderdaad een mooi panoramisch uitzicht, maar ook naast een drukke weg. We hebben een week in dit huis gezeten. Erg ruim en ook redelijk luxe ingericht. Alles wat op de foto's te zin is, dat is er. Qua tuin is wat je ziet ook precies wat er is. Niet meer niet minder. Ik verwachte een grote tuin, maar het was vooral een zwembad met zitjes er om heen. En wat kleine terrasjes rondom het huis.Uitzicht is inderdaad mooi, je kan de zee zien van een grote afstand. Echter naast een drukke weg en dito lawaai is het toch niet zo heel relaxed om hier lang door te brengen. Het huis is gebouwd om te verhuren. Het is duidelijk dat hier nooit iemand echt woont en het ontbreekt wat mij betreft daarom aan atmosfeer. Het is nogal clean allemaal. Als je een groot huis zoekt met een zwembad en op redelijke afstand van de trulli's en stadjes zoals polignare en monopoli, dan ben je hier aan het juiste adres. Zoek je sfeer en rust, dan beter een ander huis boeken. It was a very nice trip to leos apartement. First we thougt (considering the photos...) the apartement was bigger and we would have the pool for our own. We had to share it with 4 other guests, but that was no problem. It is a very quiet place with everything you need (clima, Television, pool, wonderful area). There is no wifi which was a good experience for us :-), so you can relax better without checking the internet all the time. Leo is a very friendly guy which gave us good tips about apuglia. So, what was negative? About the apartement nothing! A Thing that was very hard for us is how a lot of People in south italy do with Dogs and nature. They throw garbage everywhere. There are a lot of poor street Dogs without water (it was nearly 40 degrees!) and Food. All the selfish italian Ladys who care ONLY about theirselves drive buy with no empathy. in my opinion this is a shame for a (so called...) very relegious Country. the poor creatures die and a lot of People don´t care... corrupt People Profite because of the canili all over south italy. if this doesn´t Change we won´t come back to this wonderful place because we cant really relax when Baby Dogs are dying next to the street because no one gives them water. Nevertheless Leo´s casa is a nice place to go! 5 stars for Leo, 0 stars for italians regional politicians! Immersed in the greenery of the hill and just steps from the beach (2.9 km), HOME VILLA DEL MONTE have an amazing panoramic sea views, swimming pool and a stone; 2 also offers 'residential villas,' scattered along the slopes of the hill and surrounded by ancient olive trees. All apartments have full kitchen and bathroom and are equipped with air conditioning and LCD TV. Furnished with good taste no doubt, are different from each 'other. Depending on the size, location, internal characteristics, have been ascribed to them the names of the winds: Libeccio, Mistral and Scirocco. They can accommodate 2 adults 2 adults + 2 children. Each has a functional kitchen equipped with fridge and everything you need to prepare delicious dishes to enjoy the tranquility of the beautiful and picturesque landscape. The villa is in a strategic position, close to the sea, just 2.4 km from the spectacular bay of San Vito Polignano. Polignano a Mare is a popular tourist center and a resort famous for its fantastic scenery and crystal clear waters. And the ideal place to snorkel and swim in the clear waters in a rich scenery of cliffs and caves. The caves are ideal for hiking and pedal boats. For those in search of beautiful sandy beaches and rocky coves can be reached Fetente Cala, Cala Monachile and the golden sandy beaches of Monopoli Chapter. Alberobello is situated in half an hour. Every evening you can participate in traditional festivals, food festivals and live music from Salento. There are also many bars and famous clubs on the coast of Monopoli.